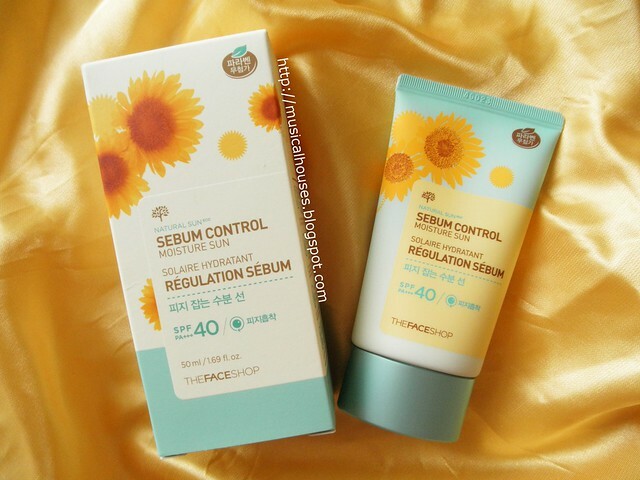 The Face Shop's Natural Sun Eco Sunscreens consists of two sunscreens: the currently existing Natural Sun Eco Power Long-Lasting Sun Cream SPF45 PA+++, and also the new addition, the Natural Sun Eco Sebum Control Moisture Sun SPF40 PA+++. These sunscreens are something I've had on my radar for a long time (ahem, a few months, if you look at how long ago this Instagram post and this other Instagram post were), and I kept vacillating on whether I should review these, since summer is kind of almost over. But since the weather is still pretty hot right now even in August, I figure I'm still not too late to the party with this review! In any case, since I live in a hot and humid climate with sun all year round, it's always summer here, and correspondingly, sunscreen is a year-round must-have! But even if you don't live in a hot sunny environment, it's always a good idea to wear sunscreen if it's a sunny day out, regardless of whether it's hot or cold. After all, even when it's cold or snowy outside, it's possible to get sunburned if the snow is reflecting sunlight. And, in my humble opinion, since sun damage is a huge contributor to skin ageing, sunscreen is really one of the cheapest and most efficient forms of anti-ageing products everyone should get! It's certainly cheaper than an expensive anti-ageing cream, and also probably more likely to actually do what it says on the packaging. The Face Shop's Natural Sun Eco Sunscreens are just one of the many sunscreens available that you can check out. As you can probably guess from the name, the Sebum Control version of the Natural Sun Eco Sunscreen is meant more for oily skin, and to help control oil, while the Long-Lasting Sun Cream is meant for normal skin types. But I'm sure you have some questions: what is the difference in formulation between the two? Is it worth getting both, or just one? And what are the sunscreen filters, anyway, and is this sunscreen going to be sticky on my skin? 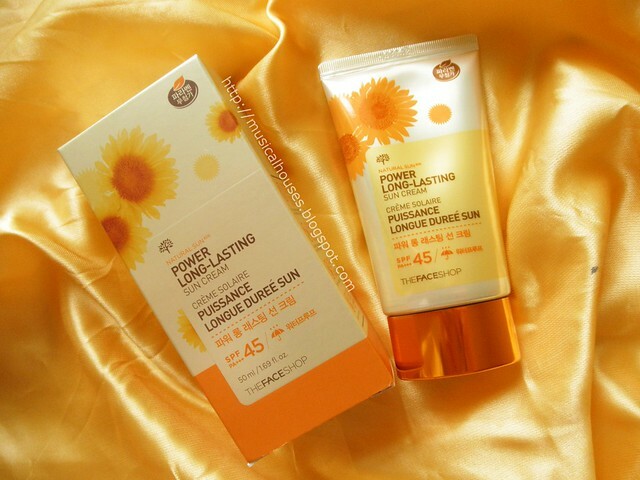 To do that, we'll take a look at the Natural Sun Eco Power Long-Lasting Sun Cream SPF45 PA+++, which is the original sunscreen that first came out, and then we'll take a look at the newer Natural Sun Eco Sebum Control Moisture Sun SPF40 PA+++. From there, we can compare the two and get a sense of the differences between the two formulas. 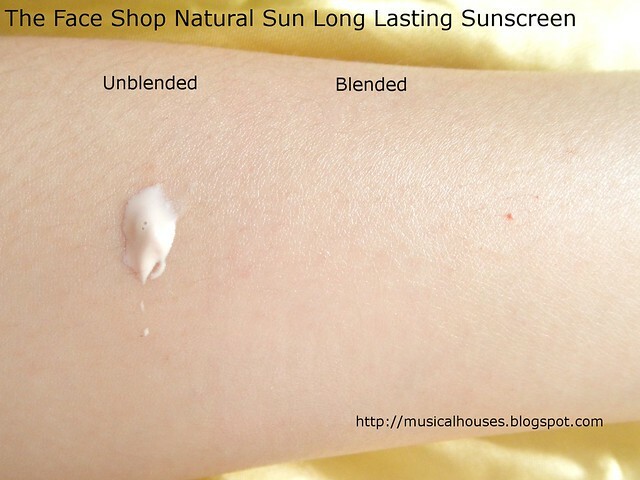 As you can see, the Natural Sun Eco Power Long-Lasting Sun Cream SPF45 PA+++ consists primarily of Water, UV filters (Zinc Oxide, Ethylhexyl Methoxycinnamate, Titanium Dioxide), silicones and polymers which help the product feel nice on skin (Cyclopentasiloxane, PEG-10 Dimethicone, Cyclomethicone, Dimethicone, Dimethicone/Vinyl Dimethicone Crosspolymer, Dimethicone/Methicone Copolymer, Methicone), humectants (Butylene Glycol, Dipropylene Glycol, Panthenol, Alanyl Glutamine), emollients (Cetyl Ethylhexanoate, Hexyl Laurate, Caprylic/Capric Triglycerides). There are also other functiona ingredients like thickeners, stabilizers and emulsifiers (Disteardimonium Hectorite, Magnesium Sulfate, Zinc Stearate, Sorbitan Sesquioleate), as well as preservatives (1, 2-Hexanediol is there as the main one, but so is Phenoxyethanol and Sodium Benzoate). Since 1, 2-Hexanediol is usually used in small amounts (of the order of 0.1 or thereabouts), everything after the preservatives are in really small amounts and fairly negligible in terms of skincare benefit. This also means that the advertised fruit extracts and plant extracts (and there are a few here - Portulaca Oleracea, Vanilla Tahitensis Fruit, and Helianthus Annuus Sprout) are also there in pretty minute amounts - they're nearly at the end of the list. While some consumers focus quite heavily on having plant extracts in their skincare (and certainly lots of marketing in cosmetics plays on that desire), as far as I'm concerned, when it comes to sunscreen, I tend to focus mostly on the actual sunscreen ingredients - that is, the UV filters. After all, a sunscreen with lots of plant extracts but a lack of UV filters is not going to perform very well in terms of sun protection! As you can tell from the swatch above, it does have a beige tint to it, but it blends out to be less visible on the skin. It generally dries down to be fairly non-sticky and matte in finish, because some of the silicones, such as Cyclopentasiloxane and Cyclomethicone, are volatile and evaporate quickly when applied. So they help to spread out the sunscreen on the skin, and then evaporate, leaving the product feeling less sticky and oily on skin. There is a little bit of shine left behind, as you can see from the swatch, but it isn't particularly major, and definitely isn't the greaseball look we all hate. The Natural Sun Eco Sebum Control Moisture Sun SPF40 PA+++ consists primarily of Water, UV filters (Ethylhexyl Methoxycinnamate, Isoamyl p-Methoxycinnamate, Ethylhexyl Salicylate, Phenylbenzimidazole Sulfonic Acid, Butyl Methoxydibenzoylmethane aka Avobenzone, Ethylhexyl Methoxycrylene), Alcohol Denat, silicones and polymers (Cyclopentasiloxane, Vinyl Dimethicone/Methicone Silsesquioxane Crosspolymer, Methyl Methacrylate Crosspolymer), humectants (Dipropylene Glycol, Butylene Glycol), and other functional ingredients like emulsifiers, pH adjusters (Potassium Cetyl Phosphate, Triethanolamine, and Polyglyceryl-6 Stearate and Polyglyceryl-3 Methylglucose Distearate, which are both emulsifiers with emollient properties). Triethanolamine and other pH adjusting ingredients tend to be used in small amounts (Triethanolamine in particular is used in concentrations of up to 5%), so after a string of pH adjusters and the like, we get the bunch of ingredients that are there in small amounts. Again, these also include the plant and other extracts (Salvia Hispanica, Gossypium Herbaceum Seed, Helianthus Annuus Sprout, and Plankton). 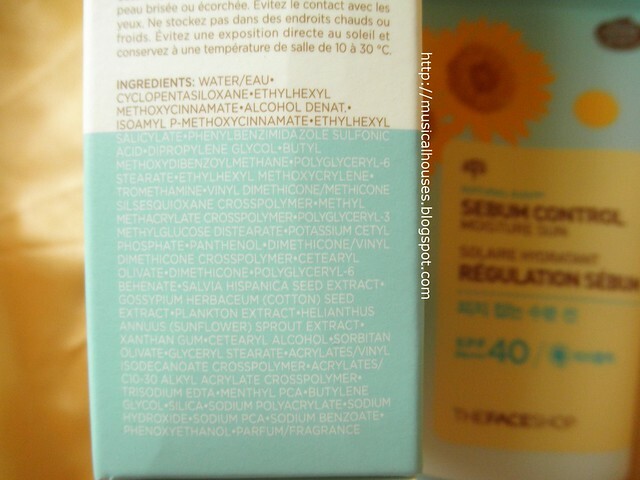 So how different is the Sebum Control version from the Long-Lasting version? Some of the ingredients are the same or similar to the Long-Lasting version, primarily the humectants, silicones, and polymers. However, where there is a huge difference is in the UV filters. You'll notice off the bat that this is a sunscreen formulated entirely with chemical filters, which often represents a tradeoff - you get a more matte finish, without the "white cast" that physical filters tend to give, but on the downside, you run the risk of potentially formulating an unstable sunscreen, or one with incomplete protection from both the UVA and UVB spectrum. Ethylhexyl Methoxycinnamate (which is also in the Long-Lasting version), Isoamyl p-Methoxycinnamate, and Ethylhexyl Salicylate all provide UVB protection. Phenylbenzimidazole Sulfonic Acid provides UVA2 and UVB protection, while Butyl Methoxydibenzoylmethane, aka Avobenzone, provides UVA1 protection. Ethylhexyl Methoxycrylene isn't a UV filter by itself, but it helps to stabilize Avobenzone, which would otherwise degrade over time. As for the other UV filters, Ethylhexyl Methoxycinnamate and Ethylhexyl Salicylate both undergo some degradation as time goes on, although Phenylbenzimidazole Sulfonic Acid is fairly stable. So, in terms of UV protection, The Face Shop has done a good job of balancing all the requirements - including all the necessary filters to provide UVA and UVB protection, and making the formulation fairly stable. While nothing beats physical filters (Zinc Oxide, Titanium Dioxide) as far as stability goes, I guess for a sunscreen that uses purely chemical filters, this isn't too bad. And, because this is meant to be a formula for oily skin, it also contains less emollients, and there is also the inclusion of Alcohol as well. Alcohol may be irritating if you have dry or sensitive skin, but if you have very oily skin, it helps to thin out the sunscreen formula and make it feel more matte and lightweight. 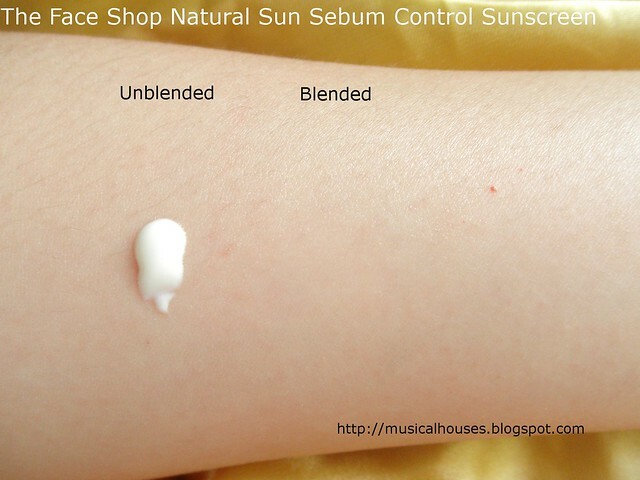 As you can see from the swatch above, the Natural Sun Eco Sebum Control Moisture Sun SPF40 PA+++ really does dry down matte - there isn't any reflectiveness on my skin at all. Unlike the Long-Lasting version, this is untinted, and goes on clear. It also does have a drier, less "wet" feel on the skin, and is a bit more lightweight. So, now that we've looked at both sunscreens, which one should you get? As far as preferences go, I think this is going to be split - there are reasons to choose one or the other, depending on what you're looking for. If you're like me, an ingredients-checking formulation nerd, and you think you can deal with a bit of shininess, then you'll probably prefer the Natural Sun Eco Long-Lasting version, because it has physical filters that make for a stable formulation. And if you have dry or sensitive skin that can't tolerate alcohol in your products, then you'll probably prefer the Long-Lasting version too. On the other hand, if your main concern is that your sunscreen should be matte, lightweight and not visible, and if you have oily skin, then you will probably think, "Who cares about the formula, just give me whatever doesn't feel gross on my skin!" If that's you, then the Natural Sun Eco Sebum Control version will probably be better for you. Also, the Long-Lasting version is also tinted beige (comparison photo below), as opposed to the clear Sebum Control version. The tint is quite slight, but depending on your preferences, it may also be a factor. Either way, they are both pretty nicely formulated sunscreens, just geared towards different preferences and needs. 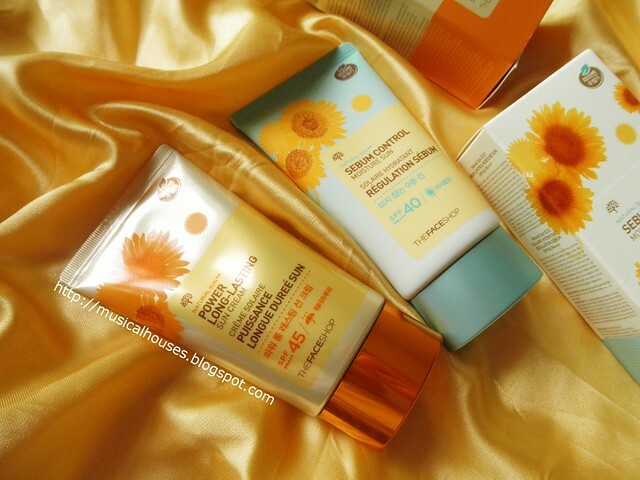 So, how would I sum up The Face Shop's Natural Sun Eco Sunscreens? I think they are worth checking out, but as for which one is right for you, that will depend on your preferences in terms of aesthetics, formula, UV filter type, and also skin needs and sensitivity. 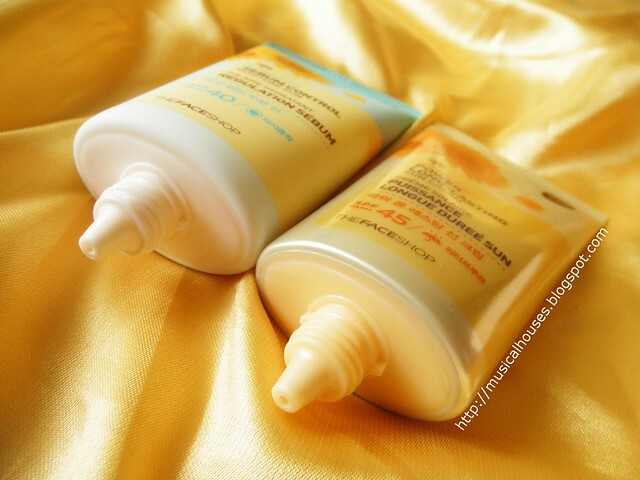 Both are sunscreens with a fairly elegant feel, and also provide broad spectrum protection without being too expensive. I personally prefer the Natural Sun Eco Long Lasting version, but I would be happy to use either one. 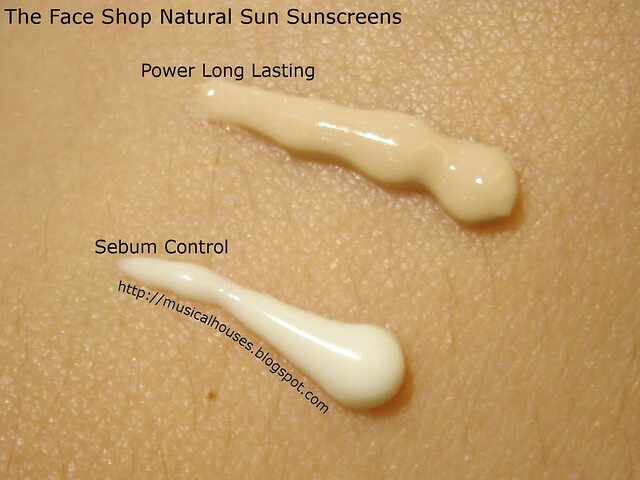 The Natural Sun Eco Sebum Control retails for S$23.90, while the Natural Sun Long Lasting retails for S$28.90. The Bottom Line: The Face Shop's Natural Sun Eco Sunscreens have two different formulas: a Long-Lasting variant with physical filters and a shinier finish, and a Sebum Control version with chemical filters and a matte finish. Thank you for a most excellent and thorough review! I use the Sebum Control version for my combo-oily skin and it is my go-to sunscreen, either by itself or as a base for other products. I really like the light, almost weightless feel of this sunscreen, and I also like how quickly it dries down to an almost invisible yet matte finish. And, most imporyantly, it certainly is effective in sun protection. I've worn it, typically several layers plus a hat, in full sun for outdoor sporting activities and have never burned nor really developed any post-sun color. And, this is certainly a tall order when, say, out on a lake fishing where there is both direct as well as reflected sun. While it is advertised as "sebum control", my impression is that, by itself, it is not a complete mattifier, but it certainly helps and is way less greasy compared to many other sunscreens. I usually use additional mattifying products with this if I'm going to be out and about and am concerned about maintaining a matte appearance. I also wouldn't say that it is completely sweat-proof (IMHO, nothing really is), and I usually reapply every couple of hours if I am in full sun and it's warm and I'm sweating. Even after a few reapplications, it's still relatively non-greasy, which is a real plus in my estimation. Awesome review. I've tried samples of the new version of this sunscreen that I got from a State-side store. I did find it was less greasy, but I still needed moisturizer as I have combo skin. Definitely a good one for those who get oily right away. What an excellent comparison and thanks for the details in the ingredients. I never tried the Face Shop sunscreens but I was thinking about trying them more than once. I think your review really helps choosing. Great review! Now I understood the difference of the two. Upon reading this, i think they are worth checking out. They seem to be great products indeed. I have skin that is sensitive to most sunscreens. I was of the opinion that physical sunscreens would be better, however, I've tried several & I still breakout, &/or they are too white or too thick & greasy feeling. I've been using the Face Shop Natural Sun Eco Sebum control one for 3 days & have had no new breakouts, so this might be my new daily sunscreen, when I'm not going to be outdoors for long periods of time or involved in sweaty activities (hiking, working out etc). I just wish the review had given an idea of whether they worked for actually preventing sun damage, perhaps a few trial runs. I've had skin cancer on my nose already & I'm a bit paranoid. So far I'm loving Biore (Japanese label) UV Perfect Milk spf 50 PA++++, for the sweatier, longer outdoor days in the sun. My powder makeup goes on over it like a dream. However I think I might still be breaking out a little, which is why I won't use it as my normal, daily sunscreen. More testing, on my face, is currently being done too see how my skin continues to react, but these 2 sunscreens so far are my favorites. All of the American branded ones I've tried continue to break me out & are otherwise unsuitable as they don't dry down well enough to put my powder make up on very successfully. @Soo Park: You can certainly apply both sunscreens on your body as well as your face! However given that the tubes contain 50ml of sunscreen, you'd probably just use it up quite fast. Hope this helps! @Anonymous: It's not likely to clog pores, although some people's skins may be a bit more sensitive! Thank you for your information. It really helps me to find a new sunscreen. I want to try it. 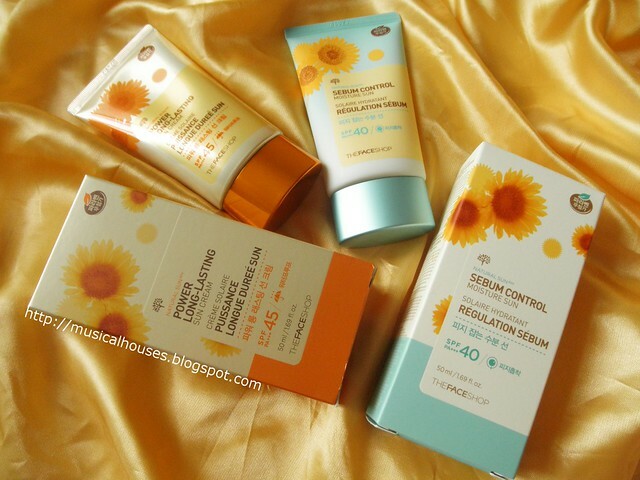 Actually, i love etude house sunprise mild airy finish sunscreen but it's really hard to find it in indonesia. Even my oily sensitive skin really loves it. Yeah. . 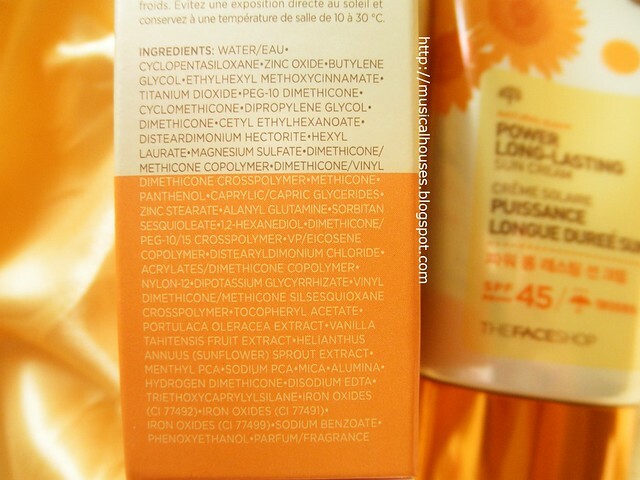 I think i want to try the face shop with the physical ingredients like zinc oxide and titanium dioxide.